Review After several delays, Fedora 16 has been delivered. While hold-ups are a characteristic of the distro's release cycle, these latest ditherings have put the latest version of Fedora a few weeks behind its main competitor, Ubuntu. Fortunately for Fedora fans this release is well worth the extended waiting time, offering an updated GNOME Shell, the Linux 3.0 kernel and plenty of the under-the-hood improvements that Fedora is known for. Dubbed Verne and sporting desktop artwork reminiscent of Jules Verne's 20,000 Leagues Under the Sea , Fedora 16 continues the role Fedora took on earlier this year as the central showpiece for the GNOME 3.0 desktop. 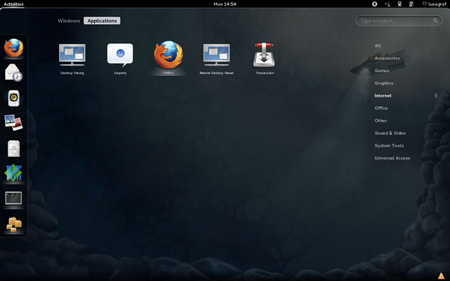 While other major distros such as openSUSE - version 12.1 of which was delivered on Wednesday - have also released GNOME 3 builds, Fedora remains one of the most popular ways to stick a toe in the GNOME 3 waters: extra effort has gone into making Fedora's basic theme and the OS's overall look fit in with GNOME 3. As such perhaps the most notable part of Fedora 16 is the upgrade to GNOME 3.2. This marks the second incremental update for GNOME but for Fedora users who haven't stayed up to date, Fedora 16 will likely mean leapfrogging straight from GNOME 3 to 3.2. The good news for those having a little trouble adjusting to GNOME 3, there will be no major changes coming in the next few GNOME releases. Instead, the GNOME team has been focusing on polishing and improving the foundations of GNOME 3 and the improvements show in Fedora 16. Among the nice improvements in this version of GNOME is the new integrated chat and messaging system that's built into version 3.2. The features mean you can automatically log into your chat and messaging accounts without needing to launch a separate application. That is, you can chat and message right from the GNOME Shell. The chat and messaging tools also bring a new set of notification windows complete with options to, for example, reply to messages, accept file transfers or even take calls, all from the GNOME shell. Also high on the list of GNOME 3.2's goals is relieving some of the pain early adopters have suffered through for the last six months. To that end, GNOME 3.2 offers a much improved workspace switcher that has a more permanent display when you're in overview mode. In other words, you can now actually get to the workspace switcher on the right side of the screen when you need it. Version 3.2 offers status bar notifications for external storage devices with options for mounting, browsing files or ejecting, all displayed at the bottom of the screen whenever you plug in a new device. GNOME 3's status bar messages have also been improved with a new option to display a counter, for example, to show the number of unread emails or new chat messages. Perhaps more useful for those who would like to get real work done in GNOME 3 is the new "do not disturb" toggle switch in the user menu. While all the functionality of do-not-disturb mode is actually part of GNOME 3.0, there's no easy way to turn it on. Version 3.2 adds a switch in the user menu and, when enabled, do-not-disturb mode will set your messaging status to busy and stop the endless stream of notifications.